Yesterday I went to Lucy's Doll House for my "spring trip". I usually try to get down once a season, but my spring trip is my favorite because I get to see what's new in the shop. Sue said she had a special doll to share, and boy did she! Yesterday, when I walked into the back room to see this amazing vintage wooden carved Hitty doll from 1954, my jaw dropped. 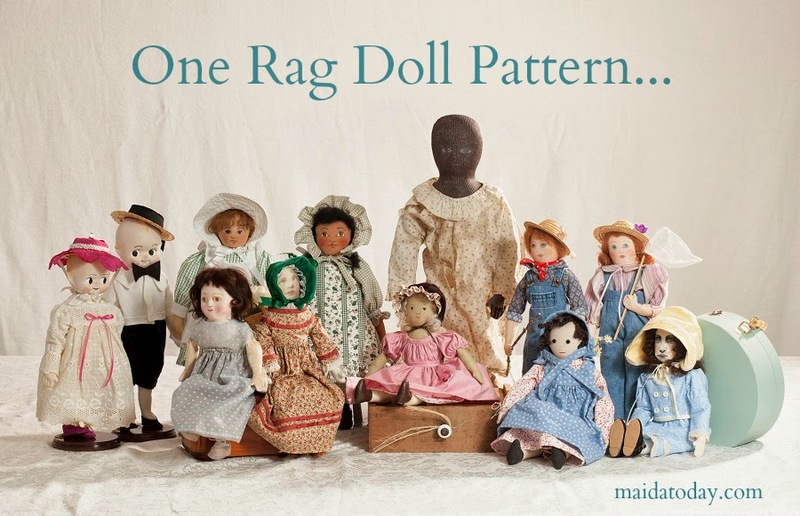 Those of you who love the original Hitty will love this grouping of items and the story of how this doll and her accessories came to be made. The lot is filled with so many points of interest, from the doll itself, to the wardrobe, to a hooked rug, the furniture to the scrapbook and letters from Tasha Tudor included in the scrapbook. Her necklace of pearls and coral was made by Shreve's in Boston. I was a little overwhelmed at how to document the group, to be truthful. I want to go back and visit it again, if it's still there. The scrapbook that came with the doll tells the story of the doll's making as well as the wardrobe and furniture that are with her. 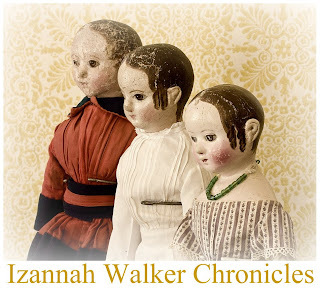 Heather, the little girl for whom the doll was made, had read her mama's Hitty book, and longed for a Hitty of her own. Her parents had a local eagle carver named William "Bill" Montville make Heather a Hitty doll. Here are rough videos I took showing the doll and collection of clothing and furniture. I have a lot to learn about using my iPad for videos! But still, you will enjoy seeing this doll move. The clothing with this doll is astounding - all made by Alice Wainwright, the maker of Polly Shorrock dolls. 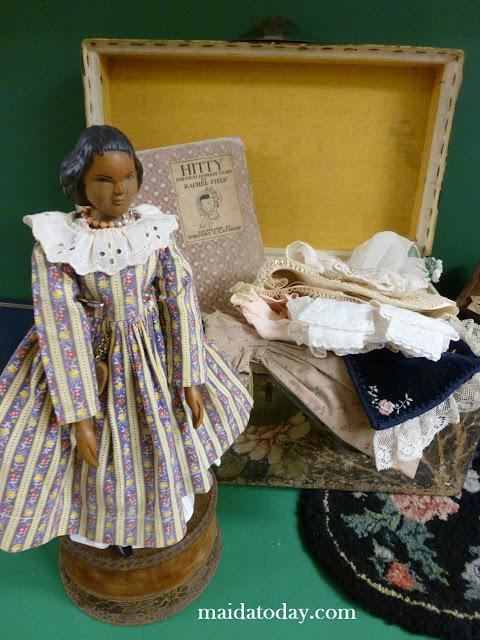 Lucy's has a group of Polly Shorreck dolls that were also owned by the little girl Heather. The clothing was made from the descriptions in the book. 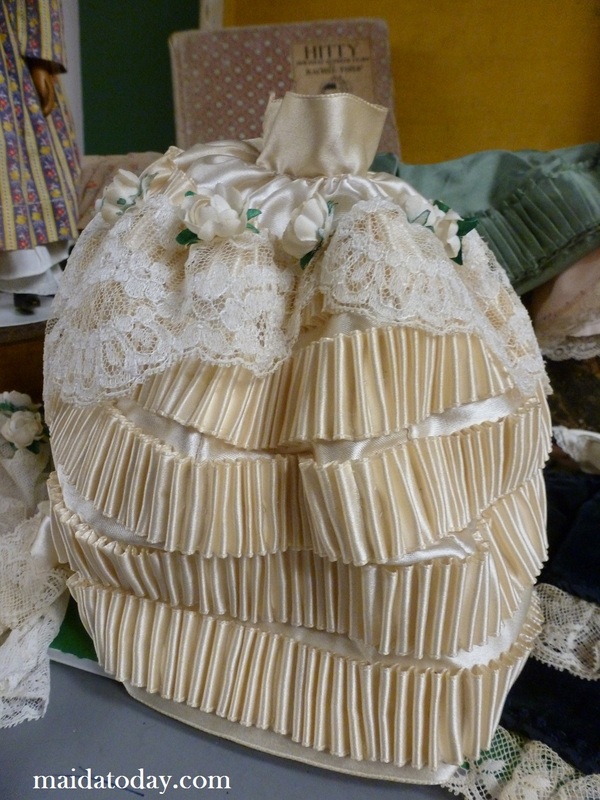 Here is the skirt to Hitty's wedding dress. What a wedding dress Alice Wainwright made for Hitty! Below is the typed history of how the furniture was made by Heather's father in his basement workshop, and what each piece was made from. Here's a video showing the accessories in this grouping. The video makes it looks like Hitty's head is moving. It is not. My camera skills are sadly lacking, and the poor iPad was trying to refocus constantly while I was moving it around. Sorry about that! But still, you get an idea of the collectionof the doll's accessories and the clothing. but that is incorrect. The cradle is made from mahogany. I believe these small letters may be "Sparrow letters"
written by Tasha Tudor from Tasha's dolls to Heather's dolls. The scrapbook has some pictures of one of Tasha Tudor's dolls. "Bill" Montville of Marblehead, Massachusetts, who also carved the doll. There is so much here to delight the viewer in this collection. This special group reflects the creation of a one of a kind group of treasures, a family's imagination and the joys of a simpler time. to share this wonderful group of treasures. Oh My! I can't even imagine owning this collection! I love Hitty and Tasha Tudor! Thanks for sharing! You're welcome! I'm glad you enjoyed it. I knew that Hitty people would appreciate it. That is amazing Dixie, thank you for sharing this treasure with us. 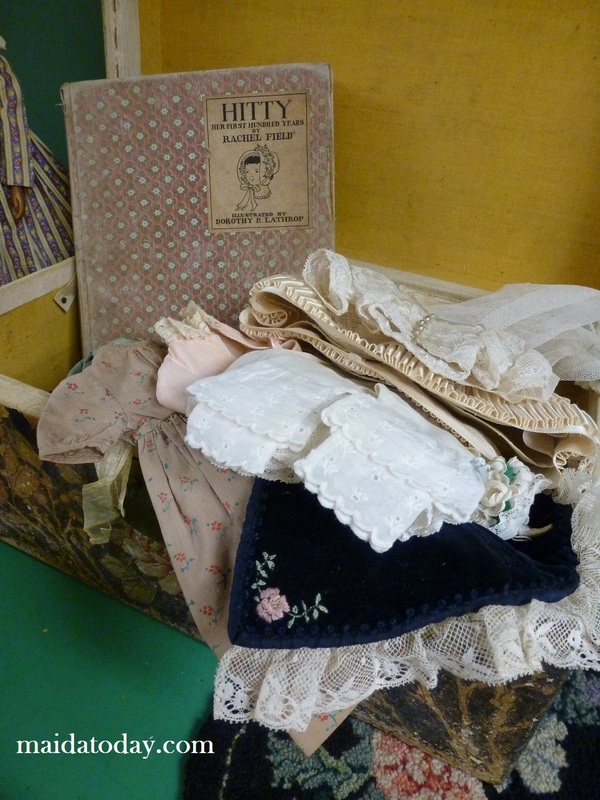 Thank you, Dixie, for sharing this vintage Hitty doll with us, and for the videos and pictures. It is a beautiful collection of items, and so well-documented, down to the wood used to make the various pieces of small furniture. I DO find it sad, however, that apparently this child, when she grew up, had no younger family member to which to hand this collection. But she did the next best thing--to place the items in this museum. IS it a museum or is it an antique store? I hope it's a museum!! Oh Wow!!! This collection is incredible and is really inspiring. I wish there was a book and pictures to document the collection. Your pictures made me hungry for more information. This is just so wonderful!!! I adore Tasha Tudor and Hitty so this is just a treasure. It amazes me to find something that touches Tasha. I'm a friend of Kristen Strand and too wish there was a book about this collection. I am totally delighted by this article. Thank you so much for sharing. This post was an absolute delight to read! I am a Hitty fan and have a copy of the book, plus a Hitty doll. Thank you for sharing these treasures with us! Richard, do you still have any Wooden Polly dolls? My mother used to be friends with your mother and I got my first Polly in 1955 from my father. I remember visiting the house on Tucker Street. Since then I have collected 16 more, including two Benjamins and a blond Polly. I just love these dolls!